Martin Havlat has announced his retirement today from the National Hockey League (NHL), following 14 seasons. Born in Mlada Boleslav, Czech Republic, Havlat played in 790 NHL games and amassed 594 points (242-352—594) along the way. Over the course of his NHL career, the forward also scored 52 playoff points, which included three overtime goals, in 75 games (21-31—52). (Nov. 13, 2015) – St. Louis Blues President of Hockey Operations and General Manager Doug Armstrong announced today the club has placed forward Martin Havlat on unconditional waivers. Havlat is seeking his unconditional release from the team due to personal reasons. Havlat has asked for privacy at this time and neither he or the Blues will have any further comment on the matter. Havlat, 34, was originally brought in by the Blues on a professional tryout and signed a one-year contract on Nov. 6. The 6'2, 210-pound forward appeared in two games with the club, recording one goal. ST. LOUIS – St. Louis Blues President of Hockey Operations and General Manager Doug Armstrong announced today the club has signed forward Martin Havlat to a one-year contract. In addition, the Blues released forward Dainius Zubrus from his professional tryout. Havlat will wear No. 29. Havlat, 34, spent last season with the New Jersey Devils, where he registered 14 points (five goals, nine assists) and 10 penalty minutes in 40 regular season games. The 6-foot-2, 209-pound forward was originally drafted by Ottawa in the first round (26th overall) of the 1999 NHL Draft and went on to be named to the 2000-01 NHL All-Rookie Team in his first season. Devils left wing Martin Havlat required a significant amount of stitches on his upper lip and bridge of his nose after being cut on a check by Jason Chimera in the second period of tonight's 6-2 loss in Washington. Havlat was not available to speak to the media after the game, but walked to the team bus on his own when he finally emerged from the locker room nearly an hour after the game ended. Havlat apparently had to have much of his upper lip stitched back together. It is also possible his nose was broken. His visor apparently contributed to his cuts. The Devils provided no update on his condition. Marty Havlat is out with a lower body injury, Sharks head coach Todd McLellan revealed on Friday. Havlat did not make the trip to Phoenix, where the Sharks will play the Coyotes at Jobing.com Arena (6 p.m. PST). In 22 games, Havlat has three goals and five assists for eight points and six penalty minutes. He missed the first 12 games of the season recovering from offseason pelvic surgery. Does Havlat – whose skills are undeniable, but who has played a decidedly soft and often times ineffective game since signing a massive six-year, $30 million contract with Minnesota in 2009 – have something to prove, now that he’s been cleared to return? The Sharks beat the Blues 3-2 in 2OT with this Martin Havlat goal, his second of the game. The Sharks have activated forward Marty Havlat for Thursday’s game against the Nashville Predators. Havlat has been on injured reserve since undergoing surgery to repair a partly torn hamstring tendon on Dec. 21 and the Sharks have been counting on his return for their stretch run and the post-season that may follow. Havlat will start the game on a line with Patrick Marleau and Ryane Clowe. He is also expected to see time on the power play’s second unit. The Sharks will be without Marty Havlat when they play the Tampa Bay Lightning on Wednesday night, but coach Todd McLellan said today the extent of the right wing’s injury remains to be determined. Martin Havlat jumps over the boards and injures himself. I wasn’t supposed to be here today. I don’t mean I’m not allowed, I mean I’m so bad at reading schedules that I didn’t realize there were more Captain’s Practices this week so when I said last week was my last that was inaccurate. There’s a big heater hanging over the bleachers in the East rink. This rink does not have the new glass and boards system. The zamboni demonstrates how much less flexible it is by giving it a sound bump before the skaters arrive. Pavs, Mitchell, McCarthy, Couture, McGinn, Havlat take the ice. Now Jumbo and Burnzie and Ferriero and Andrew Murray. Then Douglas Murray and Demers and a number 10. Nine days after the earthquake came the aftershock. In another Wild-San Jose Sharks blockbuster, General Manager Chuck Fletcher acquired much-maligned but potentially lethal goal scorer Dany Heatley on Sunday night after Martin Havlat waived his no-move clause to head west. The trade that jolted the NHL late in the evening came after the Wild acquired 24-year-old goal scorer Devin Setoguchi and two other pieces from the Sharks during the NHL draft June 24 for defenseman Brent Burns and a second-round pick. Heatley, 30, long a controversial figure who two years ago asked out of Ottawa and before that Atlanta, has seen declining production since consecutive 50-goal seasons in 2005-06 and 2006-07 with the Senators. continued and Russo also shoots down the made up Kaberle rumor signing with the Wild. You have to remember folks, these so called rumors from sources are done just to collect site hits. A Sunday night bombshell. San Jose trades Dany Heatley to Minnesota for Martin Havlat. Done deal. note: noticed Bob McKenzie broke the deal while sitting on his cottage porch, just wanted to point this out. On a night when the Washington Capitals and their star-studded lineup make a rare appearance at Xcel Energy Center, more eyes might be on Martin Havlat than Alex Ovechkin. That’s because on Wednesday, the Wild winger’s agent went on the attack over the way his client has been used since signing a six-year, $30 million contract with the Wild. Walsh’s comments put coach Todd Richards and General Manager Chuck Fletcher on the defensive Wednesday—one day after Richards and Havlat had what Fletcher called a “productive meeting” regarding these very same issues. Onlookers have witnessed a blossoming in the play of Wild winger Martin Havlat. One of those onlookers has the view from behind the Wild bench. “A visible change,” coach Todd Richards said of Havlat’s play, noting that the shifty winger’s wheels are on fire. While the Wild have been climbing the NHL charts since an awful start, going 12-5-3 in their past 20 games, Havlat coincidentally has found the game so many expected from him after he signed a six-year contract worth $30 million. After scoring 77 points on 29 goals and 48 assists for the Chicago Blackhawks last season, he came on board expected to pick up the slack left by the departure of star winger Marian Gaborik. When things are going south, positive imagery is often a big help. When Marian Gaborik would slump, he’d watch Gaborik highlights to get his mojo back. In an attempt to revive the real Martin Havlat, the Wild winger sat alone in front of a television watching some of his goals from last season’s career year in Chicago. Even though he didn’t score during Saturday’s 3-2 victory over Dallas, Havlat was a much more confident, motivated player. He skated well, shot the puck and schooled defenders. Michael Russo of the Star Tribune has the story of the Wild loss to the Ducks and also the loss of Havlat. Martin Havlat is no Marian Gaborik. Many associated with the Wild believe that’s a good thing. When Gaborik, the Wild’s all-time scoring leader and all-time leader in groin injuries, skated away to the New York Rangers through free agency last summer, Wild general manager Chuck Fletcher moved quickly to obtain Havlat, another Eastern European scoring sensation whose statistics are similar to Gabby’s. But one player who has avoided the injury thus far is Martin Havlat. After problems earlier in Havlat’s career, he seems to have solved the issue. Chicago Blackhawks assistant coach John Torchetti said he thinks he knows why. While some players do some quick stretching and then hop on the ice, Havlat commits himself to showing up well before practices and games. In an attempt to survive practices or games injury-free, Havlat then puts himself through his sweat-filled regimen. I have been told by impeccable sources that Havlat has cut his list to one team — and that’s Minnesota. According to sources, the Wild also continues to be in negotiations with free-agent center Saku Koivu, although it’s unclear how close that is. Because of the time in Finland, it could go into tomorrow. Havlat has a verbal agreement with the Wild. added 10:26pm, TSN link...paper work not completed, but deal in place…. added:11:07pm, Sportsnet Tracker has Havlat signed 6yrs., $30M. Excited to be in Minny where I was welcomed and appreciated by management. The real story about what happened in Chicago to come out. Don’t assume Martin Havlat is going to hit the open market just yet. Havlat’s agent, Allan Walsh, and Chicago GM Dale Tallon were hard at it first thing this morning, trying to see if there was some common ground between the skilled forward and the Blackhawks…. If the two sides can’t reach a deal, Havlat will be coveted by a number of teams looking to add an impact forward, teams like Montreal, which brought in skilled playmaking center Scott Gomez from New York on Tuesday. Apparently one of the reasons why the Blackhawks and Martin Havlat haven’t yet agreed on a new contract is the length of the deal. According to a source, the Hawks’ initial offer to Havlat was for a one-year contract. It’s not known if the team has moved off that negotiating position. Havlat likely would receive a multiyear deal should he reach unrestricted free agency on July 1. Signing Havlat for just one year would assure the Hawks of having more money to spend next summer when Jonathan Toews, Duncan Keith and Patrick Kane are up for new contracts. Can Chicago Afford Havlat Long-Term? The issue the Chicago Blackhawks have in re-signing Martin Havlat is that the full horror of the salary cap world will be upon them in 12 months. Probably the ’Hawks have room to pay Havlat full value for next season, but it would be salary cap-hurtful to give Havlat a full value deal that extends into the 2010-11 season. In the summer of 2010, Jonathan Toews, Patrick Kane and Duncan Keith will all be restricted free agents looking for a big raise. Andrew Ladd’s contract also expires that season. Martin Havlat was out cold for more than a minute with a vacant stare on his face. Detroit’s Niklas Kronwall had just crushed the Chicago Blackhawks’ leading scorer, and once he regained consciousness, Havlat needed the help of a teammate and trainer to get up and off the ice. He didn’t return. But two days later, the 28-year-old was in the lineup for Game 4 of the Western Conference Final. “I was shocked,” concussion specialist Michael Czarnota told CBCSports.ca. Czarnota, the neuropsychology consultant for the Canadian Hockey League, wasn’t attending the game and is not treating Havlat. But alarm bells went off when he saw No. 24 return in time for Sunday’s game. Video below is the second hit, the one that knocked him out of game 4. The only thing wrong with the Kornwall hit was that someone truly deserving of such a masterpiece such as Jordan Tootoo, Steve Ott, Matt Cooke, Sean Avery, Ben Eager, Adam Burish or Robyn Regehr wasn’t on the receiving end of it. The puck came around the boards to Havlat and shortly after it arrived in his skates, Kronwall rammed into him with his shoulder, as if he were Jack Lambert, Mike Singletary, Lawrence Taylor, Scott Stevens and Brian Herosian all rolled up into one ball of explosiveness. 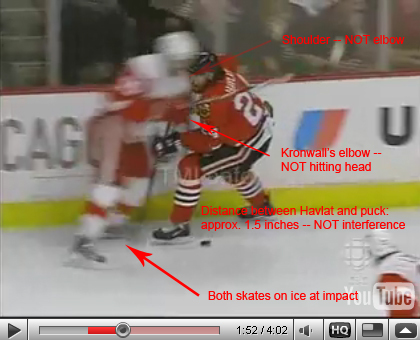 The apologists at the NHL’s website said that Kronwall “appeared to have left his feet” making the hit. more and thanks to a KK reader for the screenshot. But in a playoff season in which the NHL has gotten so many calls wrong time after time, Kronwall’s was arguably the worst miscarriage of justice outside the inexplicable non-suspension of Carolina forward Scott Walker for his goon sucker punch on Boston’s Aaron Ward. Who actually made the call? What was the explanation? The NHL needs to explain itself on this one. And apologize for screwing up so badly. Niklas Kronwall of the Detroit Red Wings delivers a hit to Martin Havlat that resulted in a five minute interference call and a game misconduct to Kronwall. Mike Cammalleri delivers a right forearm/elbow to the head of Martin Havlat. ...amid all the good signs I’ve seen from the Hawks this year—at this time of year—the one thing that struck me Tuesday night was Martin Havlat’s empty-net goal. Perhaps it shouldn’t have seemed so jarring, but it was. In a vaccuum, I’m thinking, whoa, what’s Havlat doing on the ice at the end of a game when the Hawks are trying to protect a one-goal lead? Yeah, I know, that was the question about the old Havlat, the one-way Havlat, the usually injured Havlat. I guess it still takes some getting used to. It also bears reiterating: This is not your father’s Havlat. Contract year motivation or not, the guy has been a stud. He has been to the forwards what Duncan Keith is to the defense and what Khabibulin has been in goal. Havlat leads the team in points with 73. He leads the team in assists with 45. He’s a plus-28, if you can believe that, second only to Keith. And he has missed only one game all season. One game. One game from the Czech version of Mark Prior. Of all the things coach Joel Quenneville has done right this season, ranking near the top of the list is convincing Havlat he could be a game-breaker on the checking line. Winger Martin Havlat said following the Blackhawks’ morning skate at the United Center that he would return to the lineup for Friday night’s game against the Columbus Blue Jackets. more on Chicago including Huet will be in goal tonight. Maybe, just maybe, Martin Havlat is playing himself back into the Blackhawks’ future. Havlat, who was the Hawks’ best forward heading into the all-star break, will be an unrestricted free agent after the season and all along it was believed there was no interest on the part of the organization in bringing him back. The Hawks now are at least considering trying to re-sign Havlat when the time comes, but not at the $6 million he presently earns. Martin Havlat made one Blackhawks fan very happy during Monday night’s Blackhawks game. You see, if a Hawks player scores at the 10:00 mark of the second period, an Illinois Lottery promotion awards one lucky fan $1 million. The winner met Havlat outside the Hawks locker room following the game and looked a bit stunned (go figure) as he thanked the Hawks winger. It’s interesting that Marty Havlat skated on the third line at practice Tuesday with Dave Bolland and Andrew Ladd. Are the Hawks preparing for life after Havlat? Maybe. There are rumors out there that Havlat might be the guy GM Dale Tallon tries to move to create cap space. Havlat makes $6 million and is an unrestricted free agent after the season. Do the Hawks need Havlat to make the playoffs? Not if they think of him as a third-liner. Besides, if they are able to trade him Tallon could turn around and use that cash on a top-six forward or a defenseman, or both. More and more, this is looking like the way to solve the cap problem - as long as Tallon can find a team that wants Havlat and as long as Havlat stays healthy. Paging Marty Havlet. Paging Marty Havlat. Please report to the front of the net. Havlat is frustrating the Hawks and don’t be surprised if GM Dale Tallon starts shopping the winger, who is making $6 million to not be a difference maker. Havlat is going to be an unrestricted free agent after the season and there’s no way he will be asked back. No chance. None. Up until now I thought the Hawks needed Havlat to make the playoffs, but now I don’t think they do. Maybe there’s a team out there that wants to take a chance on him and would offer a player in return. You just can’t give Havlat away at this point. His left eye swollen nearly shut and sporting stitches above and below, Dion Phaneuf was counting his blessings yesterday. “It puts in perspective how important your eyes are,” he said. Phaneuf looked worse for wear after Martin Havlat’s high stick came dangerously close to doing irreparable damage in Sunday’s clash between the Flames and Chicago Blackhawks in the Windy City. As Phaneuf closed ground to make a body check in the opening minutes, Havlat brought his stick up and hit the Flames defenceman in the face, cutting him on the cheek and eyebrow. Winger Martin Havlat traveled from the Czech Republic to attend the convention and said rehabilitation on his surgically repaired right shoulder is going well. “It has been four months, and I still have two months before camp starts,” said Havlat, who was limited to 35 games last season after twice injuring the shoulder and undergoing surgery for a second time. “I should be 100 percent. We took it slower than the other two surgeries. This time I didn’t have to push it. The Blackhawks’ Martin Havlat is scheduled to undergo surgery on his injured left shoulder in Cleveland on Thursday, according to coach Denis Savard. It will be the third time the winger has had surgery on the shoulder, the second while with the Blackhawks. He injured it twice this season, missing 22 games after suffering a dislocation during the first game of the season and hasn’t played since re-injuring it Feb. 27. Whether he’s out a week, two weeks or the rest of the season, chalk it up as yet another lost season for injury-prone Blackhawks forward Martin Havlat. Havlat injured his left shoulder again on his first shift of the second period in Wednesday’s home victory over Phoenix and underwent an MRI on Thursday afternoon. The results won’t be announced until today. Hopes aren’t high, though, considering it’s the same shoulder Havlat hurt in an opening-night scrum in Minnesota, causing him to miss the next 22 games, and also the same one he had surgery on in Ottawa. This guy just can’t stay healthy, hopefully next year will be different. I don’t buy into too many trade rumors, but one I read today said the Blackhawks were shopping Martin Havlat. Being a semi-diligent reporter I put in a call to general manager Dale Tallon and he said he’d heard the same rumor. Turns out it’s not true. “I’m not shopping him at all,” Tallon said. Tallon also said he’s not close to any other deal. The Blackhawks left the ice a little while ago following their morning skate in preparation for tonight’s game against the Detroit Red Wings. General Manager Dale Tallon announced today that the Blackhawks have recalled forwards Martin St.Pierre and Michael Blunden from the Rockford IceHogs of the AHL. The Blackhawks have also placed forwards Martin Havlat (groin), Dave Bolland (broken finger), and Ben Eager (mild concussion) on injured reserve. Hopefully for the Blackhawks, the moving of Havlat to the IR is just a short term issue. Once the Blackhawks winger found out Chicago was playing in Ottawa, he purchased a private box at Scotiabank Place for all his close buddies in the capital…. “It’s going to be special to come back there and play in my first game,” said Havlat, 26, the Senators’ top pick in 1999 with the No. 26 selection. “I’ve been thinking about it a lot lately. There were so many good nights in that building, so many special moments and the thing I enjoyed the most was that we always had a team that made the playoffs. But the biggest story tonight is Havlat’s return. The all-star winger has battled injuries for much of his first two seasons with the Hawks, although when he has played he has been one of the most dynamic scorers in the NHL. The concern is Havlat’s twice surgically repaired shoulder won’t last the season. The Hawks will be holding their breath on every hit, but Havlat won’t be. “I have to do what I do best, and if I think about it then I’m not going to be able to play the way I can,” Havlat said. Blackhawks forward Martin Havlat underwent a strength and evaluation test on his injured shoulder today at the Cleveland Clinic. The results verified that Havlat’s shoulder continues to improve and get stronger. The possibility exists that he may return to the Blackhawks lineup on Wednesday, November 28th, when the Blackhawks host the Tampa Bay Lightning at the United Center at 7:30 p.m.
*Previous updates on the ups and downs of Havlat’s recovery. Havlat has been strengthening his right shoulder and will wear a brace during practices and games. Havlat said not yet as he recovers from the shoulder injury he suffered during the first game of the season. Martin Havlat is not quite ready for a practice with contact. A little birdie (aka a report in the vaunted Chicago Tribune) told me that Havlat may be back in the active lineup at some point during the current Chicago homestand this week. Say what you will of Havlat’s fragility—and much has been said, after all—but he’s shown he’s capable of point-per-game pace when in the lineup, and there’s no reason to believe he won’t achieve that upon his return.